“We live in perfect harmony; we are all one big family here. More than 250,000 Nigeriens, as well as many more Nigerians, live in 140 sites throughout Diffa – a region in the extreme southeast of the country, near the Nigerian border. IOM, the UN Migration Agency, has been providing humanitarian assistance in Diffa since 2013 and, in 2017, built more than 6000 emergency shelters in Diffa. If you travel about 15 kilometres outside Diffa city (Diffa is both the name of the Urban Commune and its capital), you will find Boudouri. The village is almost other-worldly at first sight hosting over 250 IOM tents, home to more than 11,000 people. Boudouri’s population swelled in 2016 and continues to grow with Boko Haram attacks in Niger and neighbouring Nigeria. 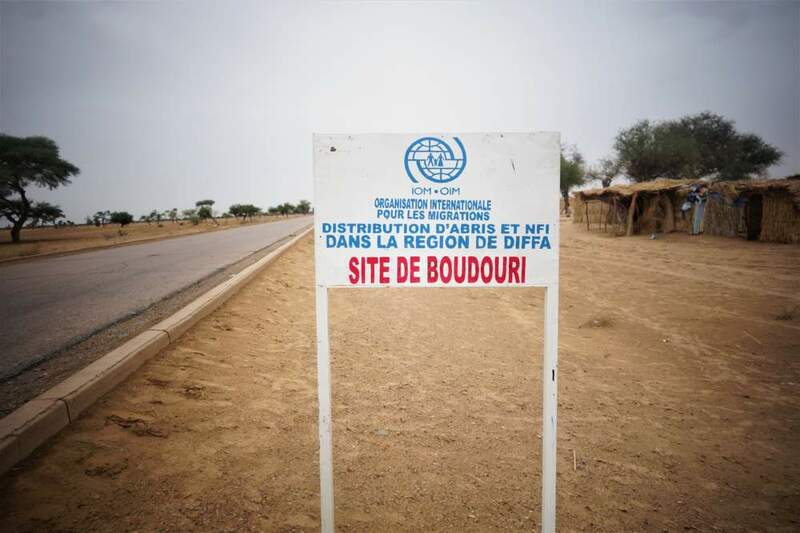 It is clear that Boudouri is much more than a temporary displacement site. Children displaced by Boko Haram violence in Boudouri. 45-year-old Kurnaram was born and raised in Boudouri. She still lives there with her husband and 12 children. 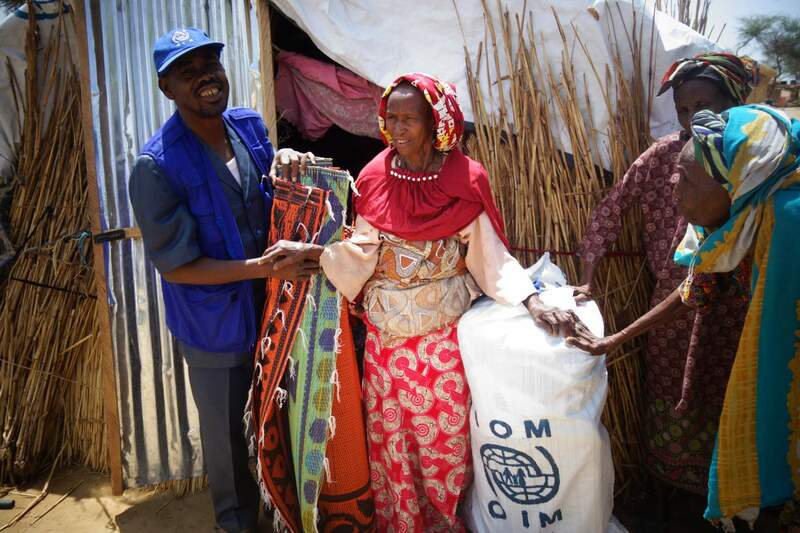 Her family was among the first households to receive IOM assistance in 2013 – tarps and other materials to improve their home. Since displaced people are now living on the land they used to farm, the family has to go further outside the village to grow their peanuts and wheat. This has not stopped Kurnaram from welcoming the new comers with open arms. She cooks for them and gives them water when ever they need it. “We live in perfect harmony; we are all one big family here,”said Kurnaram. One of the most recent assessment missions carried out in Maine-Soroa, Diffa region, found that the 1,200 households live in dire conditions. Many of the people living in or near Boudouri are originally from the Diffa region but had left years ago to try and earn a living breeding livestock on the other side of the border in Nigeria. One of these people who returned is Adiza, a warm and caring 70-year-old woman. Adiza returned to her homeland a year ago after her village in Nigeria was violently raided by Boko Haram. She heard screams outside during the middle of the night. Boko Haram took all of her family’s animals. They also took her four sons that night. She can only assume that they were killed. She explained that they were probably taken to guide the animals to safety. Adiza with her great-grandson, whose father is assumed to have died in a Boko Haram attack. She left by foot immediately after the attack with the other villagers and no belongings. 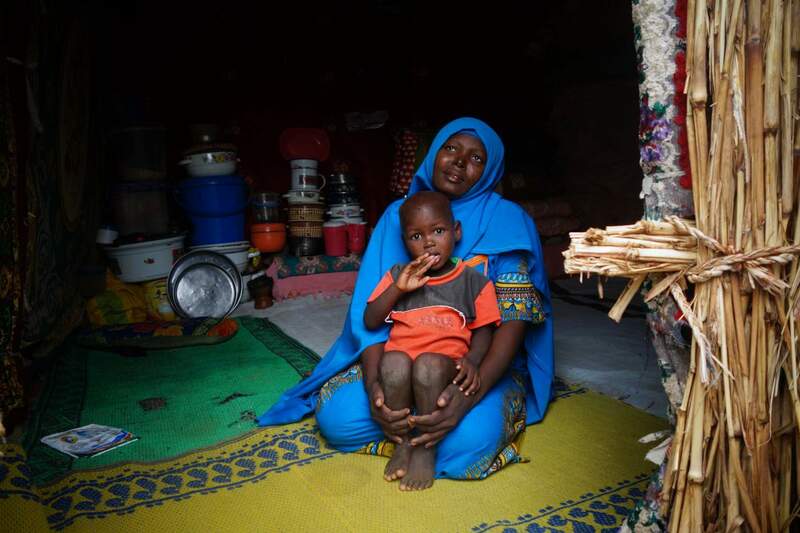 Adiza's niece is now a young widow because of Boko Haram. Adiza helps her raise her children along with the other widowed young mothers. Adiza’s tribe, the Bororo Peuhls,are well-known for their livestock breeding. It has been a strange shift for displaced Bororo Peuhls to adapt to a new way of living. Adiza became the pillar for her family; her husband had died years before the attack. She is raising numerous grandchildren left behind by her slain sons together with her daughters-in-law. Trying to gather them all for a photo proves an impossible task for Adiza. Adiza receiving materials for her home and family from IOM. Kiari was working out in the fields when some soldiers stopped to ask him for directions. He happily hopped in their car to show them the way.Within a matter of minutes, they drove over a mine. The deadly detonation killed all 11 passengers except Kiari. He managed to drag himself out of the car, but was shot by Boko Haram in the process. Luckily, they thought he was dead and left him there. He stayed down until Nigerien soldiers showed up and took him to hospital. Kiari with his children outside the shelter that they live in. 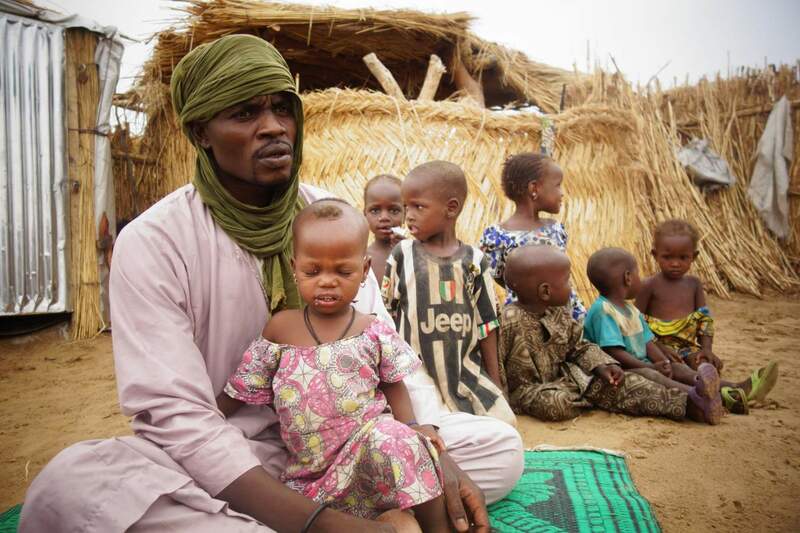 Since then, Kiari and his seven children have been displaced in Boudouri. He used to grow peppers, but, as he recovers from his injuries, he is not able for physically demanding work. Kiari has to still use a crutch as his injuries have not healed yet. In the past few years, IOM has trained more than 100 people in emergency shelter construction with help from its implementing partner, international NGO CISP. Creating new job opportunities for both the local community and displaced people is indispensable. The Boko Haram insurgency has brought on new government measures,which involved shutting down certain businesses ranging from fishing to mechanics who used to work on motorcycles - the most common means of transport which has been banned in the Diffa region since beginning of 2015. Souleyman is a 31-year-old Diffa native. A motorcycle mechanic before the crisis hit, when he found himself unemployed, he decided to completely embrace this challenge as an opportunity. He said that he would not go back to what he used to do even if they abolished the law tomorrow. He loves working side by side with people who have come to Diffa seeking safety. 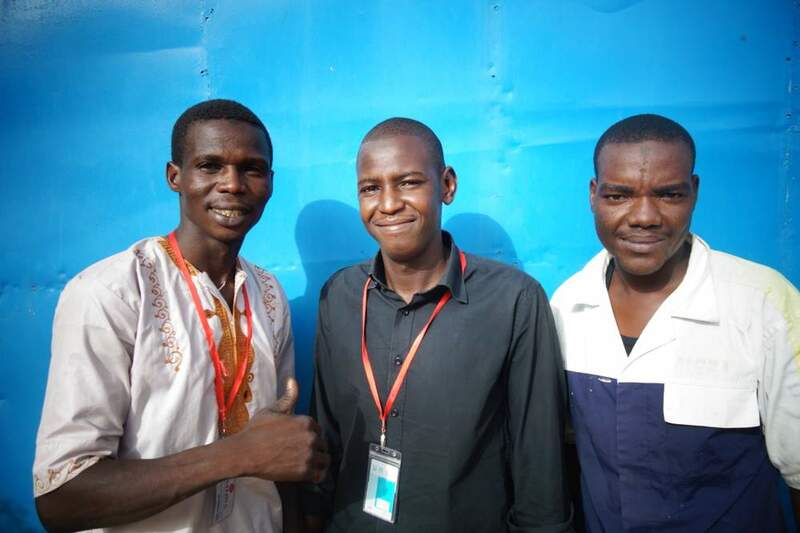 Souleyman poses with his trainer Moustapha Mahamadou and his fellow trainee emergency shelter builder, Oumara. “Most of them have perfectly integrated themselves. I wouldn’t be able to tell the difference between us and them,”said Souleyman. During the attack on her village in Nigeria, 30-year-old Haoua witnessed devastating atrocities - murders, abuse and destruction. With her husband, Haoua took her six children to try and find safety in Bosso, Niger. The family stayed in Bosso for three years until it was also hit hard by Boko Haram last June. Haoua has been living as a refugee in Boudouri for the past year, where she has given birth to her seventh child. Although fishing has been outlawed, it’s still the main source of income for Haoua’s household. Back in her Nigerian village, she used to sell henna perfume, but here she has trouble finding work. If the situation ever improves back home, she said they might consider going back. The family have been back once since the attack. The house had been broken into and everything had been stolen – they did not even have a door anymore. Margarm, 35 years old, and her two children, Hadjada and Mallam, who are 4 and 7 years old, have been displaced in Boudouri for over a year. The State had asked them to move out of their Zarwaram village as a preventive measure triggered by recent Boko Haram attacks nearby. She finds it hard not having a proper job and often has to leave her children under her neighbours’ watch so she can look for work. Margarm sits with her son in her lap in their shelter. Margarm had nothing but her two little children when she first arrived. For the first few days, they slept in a tiny cottage that is now used for their farm animals. Margarm now uses both the emergency shelter that IOM built when her family first arrived and her transitional IOM tent. Margarm's son, Hadjada, stands in their home. "I am proud of the place that I call home today." For some of these people, there is a glimpse of hope that they can return and with the Government’s help, they will. For others, reality is that they might never go back. IOM is creating better, safer and more durable shelters: longer lasting homes instead emergency shelters. As the situation is changing so are the needs and so should the response. The IOM humanitarian assistance in Diffa is provided by the U.S.Department of State: Bureau of Population, Refugees, and Migration, Office of U.S. Foreign Disaster Assistance and Central Emergency Response Fund. IOM has also recently launched an enhanced framework to address internal displacement. Find out more here: http://www.iom.int/news/un-migration-agency-reinforces-commitment-displaced-people-through-enhanced-framework-internal.